“I’m very passionated in teaching and I love to share my musical knowledge with aspirant drummers. During my studies in the USA, I’ve been fortunate to be taught by great teachers from whom I’ve learned to expand my vocabulary while improving technique, reading, time keeping, dynamics, independence, coordination, phrasing and polyrhythmic skills. Thanks to this and to the experience I’ve gained through the years, I’m offering a more efficient and organized system of study” - Elia. Lessons are individual and every student has a designed program; the material is presented in PDF format with related Play Along for each exercise. Beyond reaching the main goals of the student, the program focus on develop the weaknesses as well as fill the gaps. 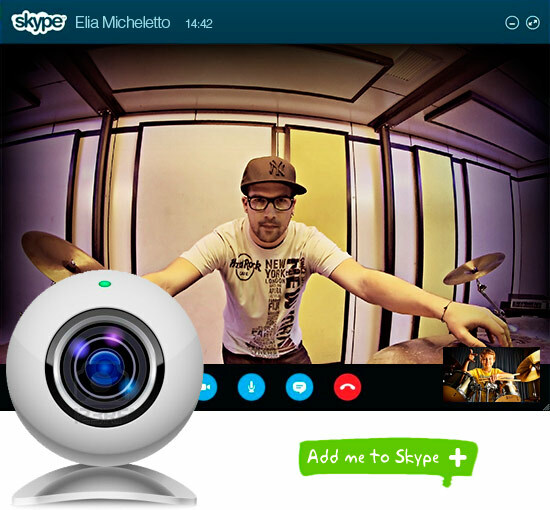 Elia is also available for Skype lessons. For info and prices, send a message through the “Contact” section. If you’re looking for develop specific arguments, video packages are available with pre-recorded video lessons by Elia. - MP3 tracks to play along to. Elia is featured by the 1# world drummer magazine, “Modern Drummer”, in a list of finest drummers and drum instructors in the world! Elia è stato menzionato dalla rivista numero #1 al mondo, “Modern Drummer Magazine”, in una lista che include alcuni fra i migliori batteristi ed insegnanti al mondo! Studiare con Elia è una sfida! Con lui ho affrontato un programma personalizzato mirato a migliorare la mia tecnica e le mie nozioni generali. Ogni lezione è piena di idee ben presentate con PDF e audio musicali annessi per ogni esercizio. Grazie alla sua preparazione riesce a creare da un semplice esercizio molteplici variazioni… È un lavoro infinito! la passione e la voglia di studiare questo bellissimo strumento. Del resto, al fine di migliorarsi, il confronto è il miglior modo di capire il proprio livello e fin dove si può arrivare. The first time I saw Elia was on video and he left me without any words. I had never seen such amazing technique and speed and also the tricks with the sticks while playing that fast. When I was introduced to him in Australia, I discovered a very nice guy very passioned about his instrument and also very humble. I had classes via Skype with him and if you’re self taught as me, studying with Elia is a real challenge. Needless to say how good he is. For his students its a great honor and opportunity to have such a master available. I am sure Elia nowadays has a place among the best drummers in the world and its just a matter of time for him to be well-known worldwide. He helped me to rediscover again my hided love with the drums! Credo che Elia sia un insegnante completo, con un’innata passione per lo strumento e le capacità per trasmettere passione, pazienza, costanza e maturità nell’apprendimento. Una giusta dose di “follia musicale” fa da panorama a quello che è l’ambiente di studio, preparando l’allievo con le più importanti nozioni tecniche. Gli argomenti trattati sono completi e approfonditi, ogni singolo dettaglio e dubbio trova risposta immediata. Testi, spartiti e delucidazioni sono sempre esaustivi al 100%. Se avete modo provate in prima persona a studiare con Elia. È disposto ad aiutare l’allievo a raggiungere gli obiettivi prefissati e, chi ha deciso di studiare in maniera approfondita, troverà in lui una risposta seria ed affidabile. Dopo averlo elogiato per l’incredibile serietà e professionalità nel suo ruolo di insegnante, non mi resta che concludere con un commento di profonda ammirazione. As I first met Elia attending one of his Drum Workshops, I was surprised by the depth of each topic in technique. When someone is sharing their passion with you and giving you amazing tools for pushing further both your technique and goals, you want more of it, don't you? Not too long later I contacted Elia and he found the time for me so we scheduled our first lesson. We started keeping classes via Skype since we live in different countries. Elia noticed I love dealing with struggling and challenges so he certainly pushed me to the edge, on every lesson. Not only does he have an incredible amount of knowledge about drumming and life, he also is a hundred percent willing to use every bit of it to make YOU the best drummer and a human beign you can be. Elia is featured on Dom Famularo's list of The Best influences in the drumming scene in the whole world, I see the reason for it. Elia makes the material for our lessons. I love studying with a teacher who knows your progress and most importantly, knows the next step. Of course it's a must when you're pushing yourself and that's why you have a teacher in the first place. Still it's not always there even if it should, at least haven't for me. Studying with Elia I can trust he knows what I need and how to work with any challenge in my technique and playing. We are constantly keeping contact which is really helpful for focusing on each topic thoroughly until we're ready to move on to the next adventures. Elia is a person who puts all of his heart to drums, music and teaching. You can see it. In case you are willing to find out where your limits are, want to open up a whole new world in drumming or maybe need a few great tips, Elia is your guy. He is also very easily approachable. I feel extremely lucky for having him as my teacher.